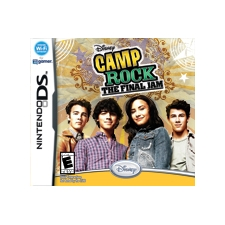 The ultimate summer camp showdown is on in Disney Camp Rock: The Final Jam for Nintendo DS! Create and play as your very own Camp Rocker and join Mitchie, Shane and other Camp Rockers back at the music camp! Meet some new campers while exploring the camp and help them out as they go against their rival, Camp Star. Rock out to songs from both Camp Rock films using your stylus to play guitar, bass and drums. You can even put down some hot dance moves wearing cool outfits for your avatar.